Last week I asked: What product is Sri Lanka best known for? Tea. Sri Lanka, formerly known as Ceylon, is the world’s fourth largest producer of tea and it is a critical part of the country’s economy. In the area around Nuwara Eliya (Little England) the rolling hills are blanketed with tea trees. 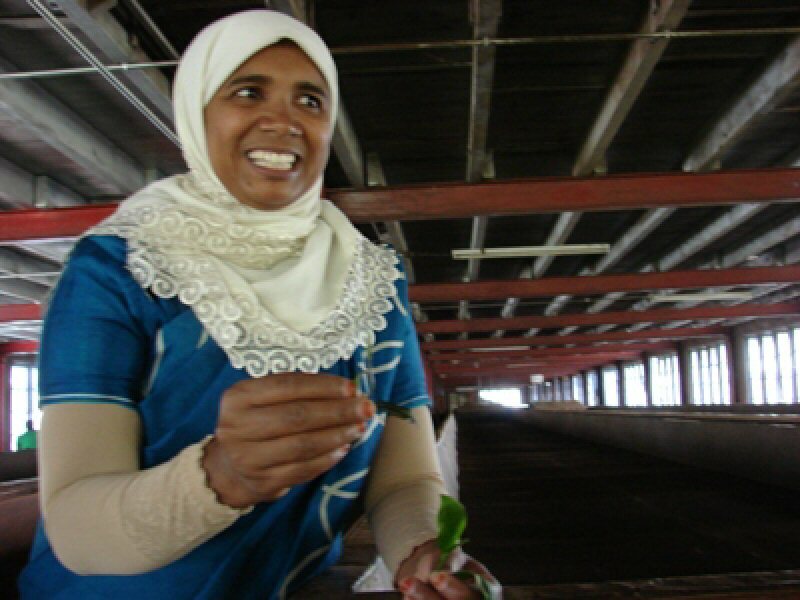 The humidity, cool temperatures, and rainfall in the country’s central highlands provide a climate that favors the production of high quality tea plus flowers and vegetables. John and I visited the Blue Field Tea Factory, which is just one of the many tea factories in the area, and learned about the process from hand-picking to drying to sorting and then grading and packaging. 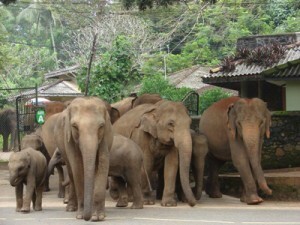 Before arriving at the tea factory we visited the Pinnawela Elephant Orphanage, arriving in time for the 9 a.m. feeding. 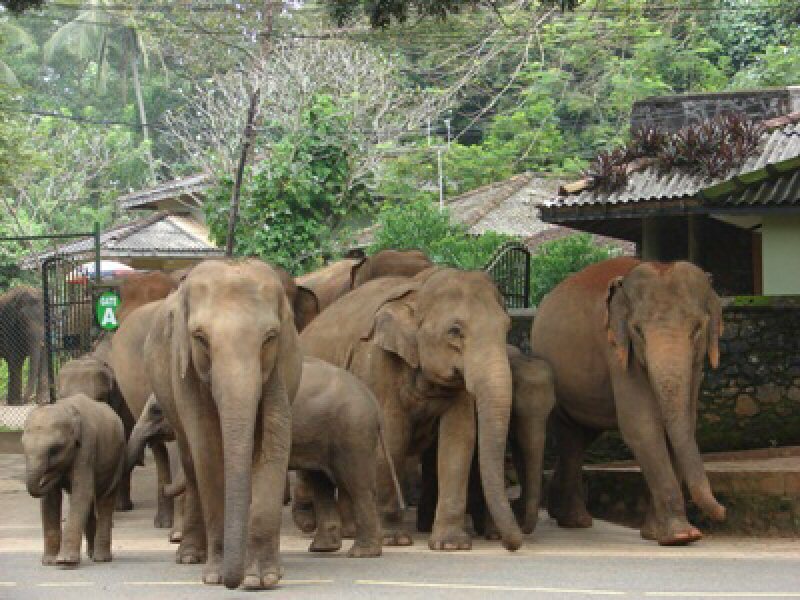 The elephants are free roaming. Three of the younger ones took turns dunking one another and holding them down. Later the drive through the highlands was beautiful with waterfalls and great views. Along the way to Yala National Park we visited a gem factory. Sri Lanka is known for its fine quality sapphires and rubies. In fact, Kate Middleton’s engagement ring, which was previously Lady Di’s, came from Sri Lanka. 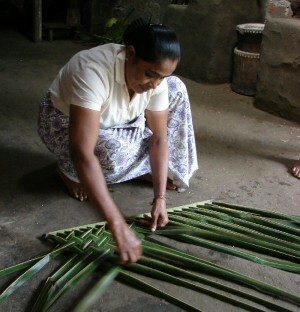 One interesting stop was a family place where they showed us many things that can be made from the coconut palm – coconut meat, coconut milk, the fiber from the husk can be made into rope, the shell is fashioned into utensils, the leaves are woven into mats and the sap from the flower becomes jaggery (like brown sugar); treacle, which is a bit like maple syrup; and then toddy which can be distilled even more to make an even stronger alcohol. They say that eight coconut palms can support one family. To make harvesting easier the toddy workers have ropes from palm tree to palm tree so they don’t have to climb each tree individually. We also stopped to see huge five-foot-long river monitors and a Hindu temple. 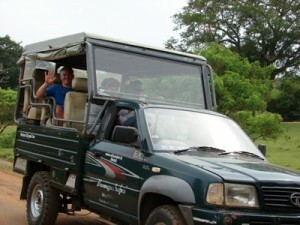 We stayed at the beautiful Chaya Wild Hotel right in the national park and then set off on a three-hour safari through the park where we saw wild elephants, wild boars, two varieties of deer, water buffalos, a slew of birds but we did not see any of the elusive leopards the park is famous for. We did stop at a memorial for some of the 34,000 who lost their lives in the 2004 tsunami. There are several memorials along the south coast. We drove along the south coast where there are many beaches, fishing villages, resorts and stopped to take a picture of the stilt fishermen who fish from tall stilts in the water. I got the impression they made most of their money from the tourists who take their picture. In Galle we stayed at the Closenberg Hotel located on a point and was, at one time, the home of a Dutch sea captain. I appreciate hotels that preserve the architecture. The hotel looked out to the Indian Ocean and had high ceilings, Dutch style doors, antique furniture plus large verandahs and balconies to allow the air to flow through. 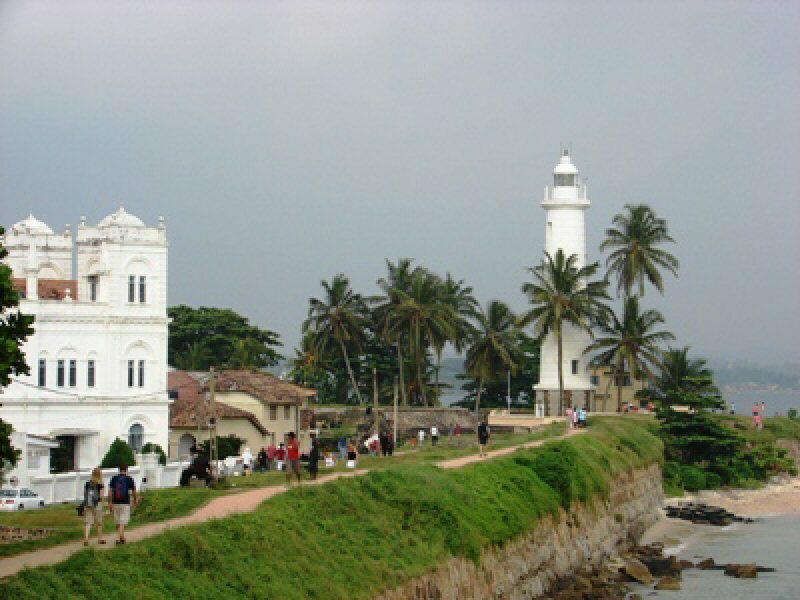 Galle Fort was first built by the Portuguese and was modified by the Dutch in the 1600s. 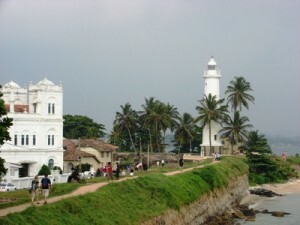 It is massive and includes the town of Galle. I would have liked more time here. Next time. Travel Trivia Tease™: What are moon stones? Look for the answer next week.